Word up! Beyond Learning is the first company to offer planet-friendly games designed to hone your tot’s reading and math skills—no screeching electronic gee-gaws required. 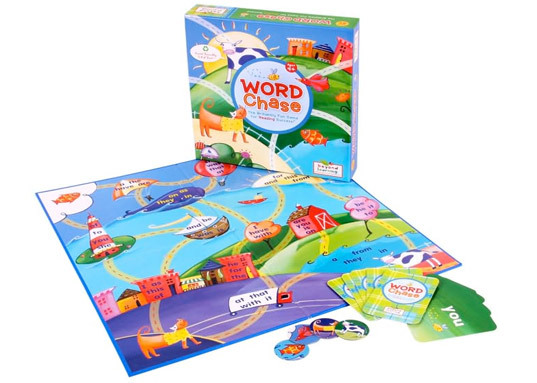 Created from 100% post-consumer recycled paper, soy-based inks, phthalate-free lamination, and water-based varnish, Beyond Learning’s beautifully illustrated games for ages 4 and up make finding words and counting numbers a fun family experience. (The little nippers will never know what hit them.) Another plus: A percentage of the company’s sales goes to Healthy Child Healthy World, a nationally recognized non-profit dedicated to protecting children’s health. Word up! Beyond Learning is the first company to offer planet-friendly games designed to hone your tot's reading and math skills�no screeching electronic gee-gaws required. Created from 100% post-consumer recycled paper, soy-based inks, phthalate-free lamination, and water-based varnish, Beyond Learning's beautifully illustrated games for ages 4 and up make finding words and counting numbers a fun family experience. (The little nippers will never know what hit them.) Another plus: A percentage of the company's sales goes to Healthy Child Healthy World, a nationally recognized non-profit dedicated to protecting children's health.